I’m a skier and have been wanting to ski the western powder I have been hearing so much about since the first snowfall in October. However, because of classes and a heavy work and social schedule I haven’t had the opportunity yet to experience it. That was until today. After packing up my car (the semester’s over!!! ), turning in my room key, I headed up to the rattlesnake to meet up w/ Christopher. We trekked the 12 miles up some crazy roads I can’t believe anyone w/out a 4-wheel drive would take (Montana doesn’t really believe in guardrails I’ve come to find). The slopes here are daunting. The elevation at the base is 5,000 ft. 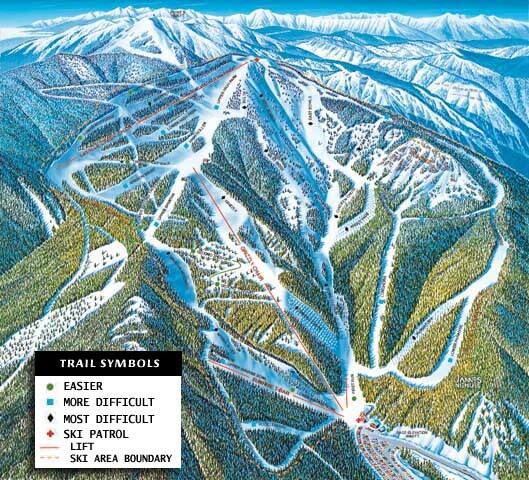 The elevation once you get off the 2nd lift is 7,600 ft. I was literally skiing in the clouds. The air was to thick up there I kept taking off my goggles because I thought they were fogging up on me. Nope! The trails were horribly marked and on our first run down we ended up on the “baby moguls” black diamond trail. Some of the greens here (for those of you that aren’t skiers, green circles are the easiest, blue squares are the middle, and black diamonds are as bad as they come) would make some of the diamonds back home cry. Most of them however I would of rated at least a blue in the east. Powder was a whole different experience & actually didn’t hurt to fall in. I wish I could of had a camera w/ me though to show everyone the INCREDIBLY view of the valley from that high up (but mind you I could only see them once I dropped below the clouds, I can’t imagine what it would of looked like from the top on a clear day! )!